Early April every year, the Simni Cherry Blossom Road, the 4 km road that connects Ssanggyesa Temple and Hwagaejangteo Market, is filled with 1,200 cherry blossom trees in full bloom. To capture this scenic view, people from all over Korea take a trip to this small village in Hadong, Gyeongsangnamdo Province and have an unforgettable moment with their beloved people. 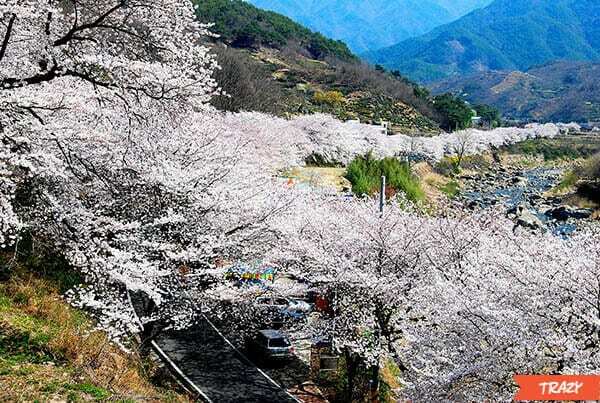 In the hope that international travelers also get to know about this charming little village, I, a member of Trazy Crew and your best online tour guide for Korea, set off to Hadong to deliver the beautiful scenery of Hwagae Cherry Blossom Festival. Trazy’s Hwagae Cherry Blossom Festival tour bus dropped me off at Ssanggyesa Temple. The tour is designed for you to walk about 4 km from Ssanggyesa temple to Hwagaejangteo Market while enjoying the cherry blossom arch over your head. Ssanggyesa Temple is one of the most popular temples in the Jirisan area and its foundation dates back to the 8th century. The layout of the buildings in the temple compound well harmonizes with the surrounding nature. The colorful, but not necessarily gaudy, paintwork on the wooden buildings doubles aesthetic pleasure in the traditional construction. The road to Hwagaejangteo Market divides into two at the temple’s entrance by Hwagaecheon Stream. Both roads laid out side by side with the stream in the middle, are filled with densely planted cherry blossom trees. 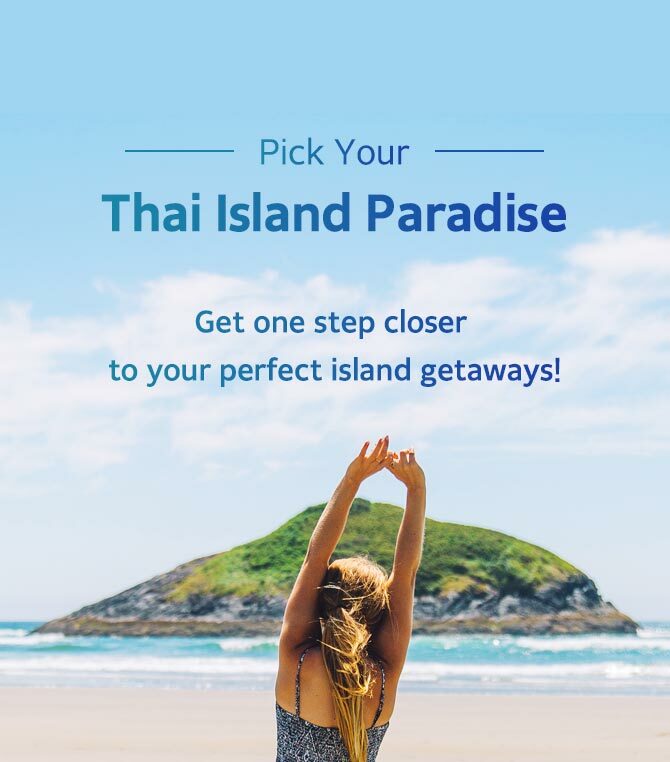 Whichever side you choose, you’ll walk under the beautiful cherry blossom arch. Also, you can switch the road at the bridges that you will encounter a couple of times on your way to Hawgaegangteo Market. This cherry blossom road has a nickname. Some people call the road “Hollye-gil” which means the “Wedding Road”. The myth behind it tells that if a couple walks this road together, they come to get married and live happily ever after. Tip 1. Try Cherry Blossom Oyster & Ice Cream! By the time my legs felt tired and I needed something to eat, I came across a few food tents and snack bars. While the food is generally slightly over-priced, it is worth trying this unique local food of the area, Beotgul – the cherry blossom oyster. This oyster is caught from Seomjingang River in the local area. Unlike other oysters, this inhabits freshwater and grows as big as a human hand. I ordered one huge oyster. The server lady cut one of the shells off, took the flesh off from the other shell, chopped the flesh into a mouthful size and topped it with sour and spicy chili sauce. If you feel put off by raw freshwater food, you can also ask to cook it. I kept walking towards Hwagaejangteo market, the pick-up point for the tour bus to Seoul. This time I came across an ice cream stall famous for the cherry blossom ice cream. They added cherry blossom syrup in the ice cream mix. The ice cream is very sweet and you can taste the flowery flavor in it. I continued to follow the road with the ice cream on one hand, and the camera on the other hand. Tip2. Walk More for the Greater View! As I got closer to the market, the view became even more picturesque because the cherry blossoms begin to bloom near the market and they gradually spread up to the temple, the higher area. My view became brighter and brighter every time I took a step forward. The snow white cherry blossoms absolutely dazzled my eyes. The magnificence of the view reaches its peak at the end of the 4-km cherry blossom road and I finally met Hwagaejangteo Market with its signature thatched roof stores. Hwagaejangteo Market is located where Hawgaecheon Stream joins Seomjingang River that divides Jeollanamdo Province and Gyeongsangnamdo Province. For its geographical feature, the market traditionally served as a meeting point for people from different provinces. People from Gyeongsangdo Province and Jeollado Province would come to Hwagaejangteo Market and exchange their local produce. The statue symbolizes a pedlar who used to travel across the country to sell goods in Hwagaejangteo Market. You can find locally cultivated green tea and herbs, pottery, and rice wine in the market. The beautiful scenery of the surrounding area attracts heaps of tourists all over the country. The market, of course, serves as an agora for people from different regions to meet. Although it is warm during the day in early April, mornings and nights are still chilly and you definitely need a jacket. The tour starts in the early morning and the temperature is highly likely below 10-degree Celsius. It would be wise of you to wear thin clothes in layers during this season. The area is not hilly but you’ll have to walk the 4 km cherry blossom road and more. Make sure you wear comfortable walking shoes. Cherry Blossoms in Hadong, located in the southern part of Korea, bloom earlier than those in Seoul. Make sure you plan the trip for the first week of April if you want to visit Hwagae Cherry Blossom Festival. Looking for other cherry blossom festival tours in Korea? Hi, would this festival still be open to public around 14-19 April? as I would love to see them when i get there. Cherry Blossom Festival just so much best to enjoy around the DC for sure. I am sure that that would be so much nice to try out for getting fun. This is really nice to try out something amazing like that. I would surely relish with great cherry blossom flowers surely.